Simple, ready in an hour vegetarian pot pie made from scratch. 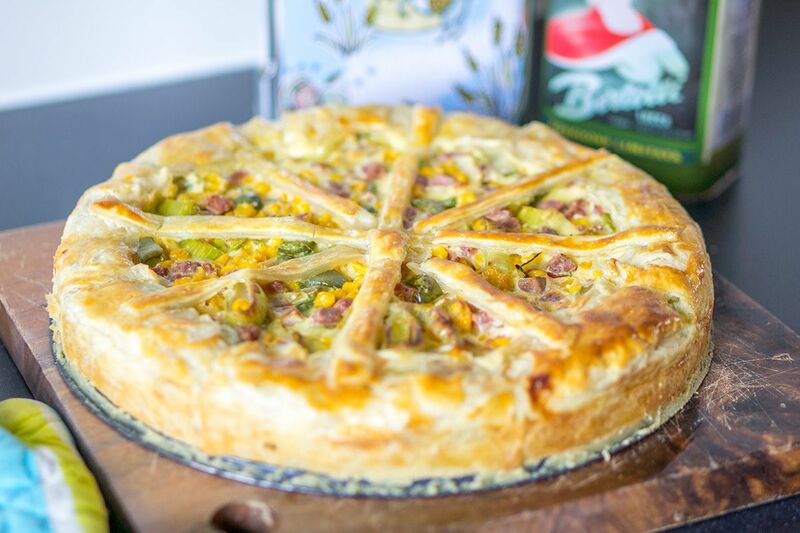 Smells and tastes delicious, you gotta try this vegetarian pot pie yourself! If frozen, grab the frozen puff pastry from your freezer and set aside to thaw. Cut the leek and green bell pepper in pieces. Drain the can of sweet corn. Put a skillet on medium high fire and bake the vegetarian diced ham until golden brown. Add in the sliced leek and green bell pepper cubes and bake for 1 to 2 minutes. Turn heat to low and add in the drained sweet corn. Stir and mix together. Season with salt and pepper. Turn off the heat after a few minutes. Grab a large bowl and add the boursin (or cooking cream) along with 4 four medium-sized eggs. Whisk the ingredients together until it becomes a nice, creamy mixture. When using a standmixer be sure to use it on the lowest setting to prevent splashing due to the stiffness of the boursin. Pre-heat your oven to 200 degrees celsius or 572 degrees fahrenheit. Add flour to the round springform pan, then lay out the unfrozen(!) puff pastry alongside of the baking tin. Leave no spot uncovered otherwise the filling will spill while baking. Add the vegetarian pot pie stuffing smoothly and slowly. Fold the upright edges of puff pastry inwardly to the center of the pot pie. Bonus: you can decorate the pie if you have some left-over puff pastry, as we did in the photo. Separate the last egg and by using a silicone cake brush cover the yolk over the puff pastry. Bake the quiche for 30 to 45 minutes depending on how powerful your oven is. looks like a delicious pie!